We are proud to announce today that Hadley Heath Manning is the recipient of the 2016-17 Tony Blankley Chair for Public Policy and American Exceptionalism. Manning will receive a $10,000 stipend, as well as support for travel, speaking engagements and investigative reporting trips. She will be honored at a dinner as part of the Steamboat Institute’s 8th Annual Freedom Conference & Festival in Steamboat Springs, CO on August 26, 2016, where Carly Fiorina will be the keynote speaker. “Hadley will be a strong and committed Fellow who will work hard to advocate for the Steamboat Institute principles that Tony wrote and spoke about so forcefully and eloquently,” said Lynda Davis, widow of Tony Blankley. In addition to naming Hadley Heath Manning as the 2016-17 Chair, the Steamboat Institute is announcing that previous Chairs Jillian Melchior and Tom Rogan will continue to work with the Steamboat Institute as Senior Fellows. “In recognition of the outstanding contributions of Tom Rogan and Jillian Melchior, we are continuing our collaboration with each of them as Senior Fellows. We will be establishing a nationwide Tony Blankley Fellows Lecture Series and will also provide support for their investigative reporting on matters of national and global interest,” said Schubert-Akin. 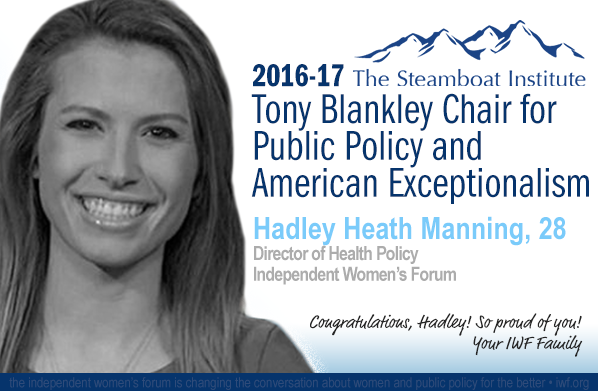 Hadley Heath Manning is a senior policy analyst and director of health policy at the Independent Women’s Forum. 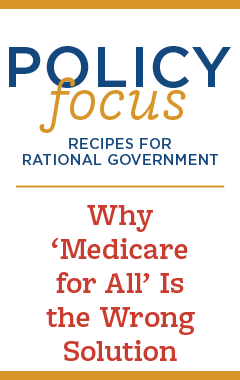 She frequently comments on health care, entitlements and economic policy, and manages IWF’s health policy projects and publications. Manning appears frequently in radio and TV outlets across the country, including Fox Business’ Stossel Show and Fox News’ Your World with Neil Cavuto. Her work has been featured in publications including the Wall Street Journal, Forbes, POLITICO, Roll Call, Real Clear Policy, National Review Online and Huffington Post. In 2016, Manning was named to Forbes’ 30 Under 30 list in Law and Policy. In 2015, the Republican National Committee honored her as a Rising Star, and in 2014, she was named to the Red Alert Politics 30 Under 30 list. She has also completed the National Review Institute’s Washington Fellowship, class of 2012-2013. Manning graduated with distinction from the University of North Carolina in 2010 as a Morehead-Cain Scholar with a double major in economics and journalism. The Tony Blankley Chair for Public Policy and American Exceptionalism was established by the Steamboat Institute to provide high-profile recognition and financial support to emerging conservative thought leaders who share the principles and ideals espoused by the late Tony Blankley and the Steamboat Institute. Those principles are lower taxes, limited government, free market capitalism, individual rights and responsibilities, and strong national defense. Tony Blankley (1948-2012) was editorial page editor of The Washington Times. He served as press secretary for Newt Gingrich during his tenure as Speaker of the U.S. House of Representatives in the 1990s. He was also a regular panelist on The McLaughlin Group and later served as Executive Vice President with Edelman public relations in Washington, D.C. Mr. Blankley served as Conference Moderator for the Steamboat Institute’s first three Freedom Conferences (2009, 2010 and 2011). Jillian Kay Melchior, political editor at Heat Street, is a fellow for the Steamboat Institute and Independent Women’s Forum. She does investigative reporting on domestic issues, including government waste, fraud and abuse, energy and environment issues, and organized labor. She has lived in China, reporting on Christianity and persecution, and has also done foreign correspondence in Iraq, Ukraine, Hong Kong, Macau, Taiwan, Eastern Europe and elsewhere. She has worked as an investigative reporter for National Review and the Franklin Center, an editorial writer for The Daily, an online editor for Commentary, a Robert Novak fellow, and a Bartley Fellow at the Wall Street Journal Asia. Her writings have been published in National Review, The Wall Street Journal, Cosmopolitan, The New York Post, The Weekly Standard, Commentary, TechCrunch, The Detroit News and other publications. She is a graduate of Hillsdale College and a native of Cheyenne, Wyoming. Rogan is based in Washington, D.C., and is a columnist for both National Review and Opportunity Lives. He is a panelist on The McLaughlin Group and makes frequent appearances on various TV programs, including The Greg Gutfeld Show, Real Time with Bill Maher, Fox News, CNN, Newsmax TV, BBC News and many others. Rogan is an honors graduate of King’s College of London (War Studies) and a graduate of the law program at The College of Law, London. The Steamboat Institute is a Colorado-based 501(c)(3) non-partisan educational organization, founded in 2008. The Steamboat Institute promotes America’s first principles and inspires active involvement in the defense of liberty. For more information on the Steamboat Institute, the Tony Blankley Chair and the 8th Annual Freedom Conference & Festival, Aug 26-27, 2016, please visit www.steamboatinstitute.org.